When you have a heavy work load throughout the week, a daily work schedule template Excel workbook is a great way to help you keep track of what you need to do. You will not have to worry about missing appointments, being at work on time, or making important calls. You can get the daily work schedule template Excel workbook for free by clicking the link available on this page. You will get to view your daily work schedule template Excel on a daily basis. When you have a day that you need to schedule something, be sure to go to that date. When you are on the correct date, you will need to select the time the event is taking place. As you select the time, you will have the option to enter text in the box next to it. This is where you need to list your breaks, lunch, meetings, important phone calls, or anything else that needs to be done. You can also look at the daily schedules in a week in advance. This way you can prepare for the upcoming week’s events. If you enter anything incorrectly, you can simply edit the text or delete the entire schedule for the time frame needed. Be sure to look at the daily work schedule template Excel workbook in advance to see what needs to be done or if any appointments need to be changed. When you are selecting a time, make sure you select the proper AM or PM time that you are needing the event to take place. You do not want to schedule an evening event in the morning and be there at the wrong time. Highlight important events in order for them to stand out. You can even color code different things on your list to make it easier to read. Check your schedule everyday to make sure that you are completing everything needed. 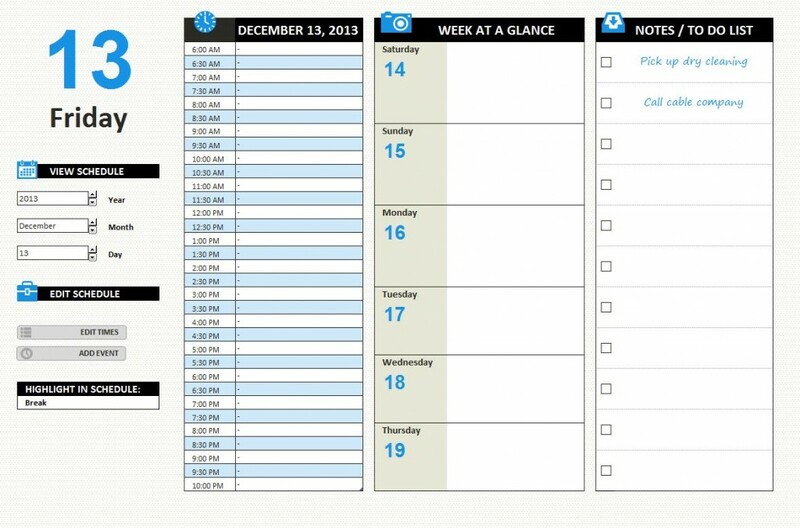 Be sure to download you free, customizable daily work schedule template Excel workbook today. The template is easy-to-use. You will be able to edit your schedule as you need it.